Only NBN's sec teams were outfitted with systems that could read data flows and see into the Net. Hope you enjoy playing against Asset Spam because they are here to stay. While lately HB has been tearing up the meta thanks to a few broken cards, other factions also have their fair share of success with going horizontal. The deck which won worlds last year was a CTM deck after all. And while they are not as popular (something I still don't entirely understand) as they once were, AR-Enhanced Security is definitely going to help them out. The idea is quite simple. 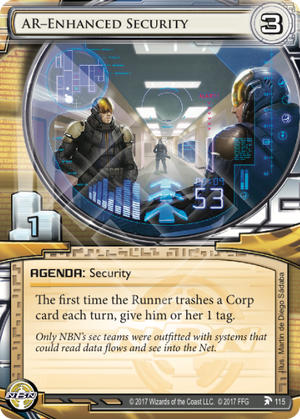 Once you have this scored, the runner takes 1 tag the first time they trash a corp card. My first thought when reading this card was, "Christ almighty, even more reason to stay clear of assets." But it says, any corp card. ANY CARD. And also anywhere. It is even better than Controlling the Message's ability in this regard since there is no trace and the card does not have to be installed. Run a Parasite ice destruction deck? That triggers this agenda. Want to trash that BOOM! in the corps hand? Take a tag. Do an RD deep dig and get rid of a Jackson Howard so you can go even deeper next run? Take a tag please. And while the tag can be avoided by cards like NACH, there is no trace involved, so decks which historically were hard counters to CTM such as Rabbit Hole Kate or Andromeda don't help you out against this. There are obviously a few counters against this agenda. The most obvious one is the new Tag Me anarch archetype, which revels in the amounts of tags they get. I imagine they might become more popular in the coming months. There is also Salsette Slums, which saw a lot of play a while ago but has fallen a bit out of grace. There is also Jesmi.. who am I kidding, she will never be relevant. You could always ignore the corp's plan and just hammers centrals, which against CTM especially people often did anyway. But this kind of hail-mary strategy is always somewhat desperate and with the speed a faction like NBN has, I don't know how viable it will be. Anyway, I really don't understand why this had to be made, and a 3-1 agenda no less. Even on a 4-2 this would be extremely powerful. Guess Asset Spam is the direction FFG wants to take the game. May there be mercy on man and machine for their sins. If it is scored quite soon in the game, the runner immediately looses the ability to keep the assets of the corp in check. I mean, which runner card gives 1 extra click and 2 extra creds per turn?